The dog show was over and friends were gathered at the home of renowned Newfoundland breeder, Megan Nutbeem. Forced to step back from breeding a few years ago due to failing health, Megan has retained her interest in the Newfoundland breed and her health issues haven't stopped her from hosting the event to visit with friends old and new. The hospital bed in the living room was the social center from which Megan cheerfully encouraged people to help themselves to Dirty Martini dip and to pick up a slightly raunchy cocktail napkin. Towards the end of the party, the cracker bowl was empty and guests were finishing their second or third drink. People were clustered in quiet groups. All of a sudden a banging began as Arayo raced around the room. Like the party guest who'd had a few too many drinks and decided to dance with a lampshade on her head, Arayo was smashing into objects with a metal trash can attached to hers. Before anyone fully realized what was happening, she sent the can flying across the room. Further investigation revealed that someone had dropped a shrimp tail into the trash, and Arayo, thinking it had been abandoned long enough that she could claim it as her own, dove her head into the long narrow bin, then was unable to pry herself out without creating a scene. Once she'd pulled herself together, she laid at the feet of a gullible guest and practiced the fine art begging. The remaining two shrimp were at his fingertips and he offered one to her. She gently accepted the treat, chewed on it a bit, then, jumped up, spit it to the ground and began rolling in it. 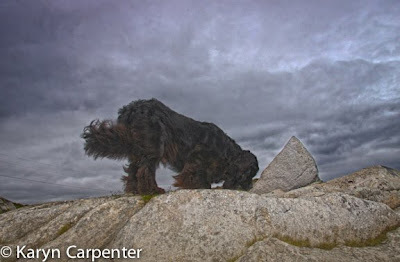 Some days you can clean a Newf up, but you shouldn't take her out……..
Photo: Arayo explores the nooks and crannies of Newfoundland's Coast. It wouldn't be the first time someone has danced at a Nutbeem party with a lampshade on their head!